A talking doorknob in the door to Wonderland. To enter, you must turn him—and "One good turn deserves another," as he would say. Doorknob was the only character in "Alice in Wonderland" (1951) who didn't first appear in the original story. "What a racket. How's a doorknob to get any sleep?" The Doorknob appears in Kingdom Hearts, Kingdom Hearts 358/2 Days, and Kingdom Hearts coded. The Doorknob's mouth contains the Keyhole to Wonderland. Sora, Donald, and Goofy followed the White Rabbit into the Bizarre Room. As soon as they enter, they see that the White Rabbit has shrunk and ran through a small door. Sora and his friends look at the door and wonder how the White Rabbit got so small. Much to their surprise, the Doorknob starts talking and tells them to try the bottle on the table, then goes back to sleep. Much later, Sora comes back to the room and defeats the Trickmaster. The Doorknob wakes up after the battle and yawns to reveal Wonderland's Keyhole, which is inside of his mouth. Afterward, the Doorknob goes back to sleep. After Sora, Donald, and Goofy help Alice escape from the Queen of Hearts's trial, they return to the Bizarre Room through the Doorknob. When Roxas first visits Wonderland and enters the Bizarre Room, he is originally trying to find the White Rabbit that ran past him, but finds the Doorknob instead. The Doorknob tells Roxas that the Rabbit drank from the bottle on the table. Roxas, being confused, asks the Doorknob about the White Rabbit and the door, but the Doorknob is fast asleep and won't answer. While exploring the Bizarre Room, Data-Sora sees the Doorknob, who has been turned sideways due to the bugs. Data-Sora volunteers to eradicate the bugs afflicting the Doorknob, and after Data-Sora returns from the System Sector in question, he receives the "Doorknob" Inkling. The Doorknob is, true to his name, a sentient, gold door handle. His escutcheon plate is shaped like an elongated trapezoid with a semi-circle bump on the bottom and a curly design on the top, giving the Doorknob the appearance of having a chin and hair, respectively. A gold screw on each bottom corner of the plate keeps the Doorknob attached to his door. He has close-set, beady yellow eyes and what seem to be black "eyebrows", though these may actually be engravings on the Doorknob's plate rather than hair. The Doorknob's prominent bulbous nose is actually the knob part of a doorknob, the part that is turned to open the door, something the Doorknob doesn't pretend to enjoy. 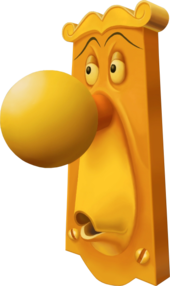 His mouth is the keyhole part of a doorknob (as well as the Keyhole of Wonderland), though it is not fixed in place like it should be; the Doorknob has no problems moving his "lips" to talk. Although the Doorknob appears in Kingdom Hearts Re:coded and has talk sprites, he is not listed in the Debug Reports. The Doorknob is not particularly helpful, caring only about getting sleep. He is lazy, quite obviously, as a short cutscene is always played when approaching him that shows the Doorknob snoring. He does, however, offer some help, as he tells Sora that he is too big, and that he will need to drink the potion. He is also rather acerbic, as shown when Goofy offers a pleasurable "G'mornin" in Kingdom Hearts and he bluntly says, "Goodnight! I need a bit more sleep." The Doorknob first appeared in Walt Disney's 1951 film Alice in Wonderland as a minor character. After falling down the rabbit hole, Alice meets the Doorknob, who acts as the doorway to Wonderland. When Alice asks to pass, the Doorknob instructs her to drink a bottle of liquid to shrink herself in order to pass. Unfortunately, she left the key on a table that was supposed to open the Doorknob. He then tells her eat a sweet that would make herself large, but this backfired and made her into a huge giant. Once Alice drank the shrinking potion once more, she becomes trap inside in the now-empty bottle and travels into Wonderland through the Doorknob's mouth. At the climax of the movie, the Doorknob encounters Alice when she was trying to escape from the Queen of Hearts, but he was locked. However, he informs that she was already outside and was just asleep. This page was last edited on 20 March 2019, at 15:11.